1. Your satisfaction is 100% guaranteed!!!! 2. You can order from us with complete confidence. We personally stand behind every item we sell and we strive to ensure the highest customer satisfaction. 3. During the first 14 days, if you are unhappy with your Hair Extension for any reason, simply let us know and we will promptly refund your money for merchandise returned, or exchange your Hair Extension, whichever YOU prefer. No Questions asked. POLICY EXCLUDES: PASTEL hair extensions and/or any Custom made orders, which are not refundable, returnable or exchangeable. 4. Our 14 Days No Hassle, No Restocking Fee Return policy, ensures that you can return a product for any reason (we do ask that the product is returned in its original condition and packaging), but Customers need to afford the return shipping cost of the hair extensions. Please Note: Shipping and handling charges are not refundable. The customer is responsible for shipping and handling charges for any exchange. But if it is our responsibility, you get a full refund. 5. Prior to returning an item, please contact our customer service team at sales@hairfauxyou.com and allow us to resolve your issue. In the event that you do need to return or exchange an item, it can be done as long as the item is in new and unused condition, inside its original packaging with all the hair pieces. 6. 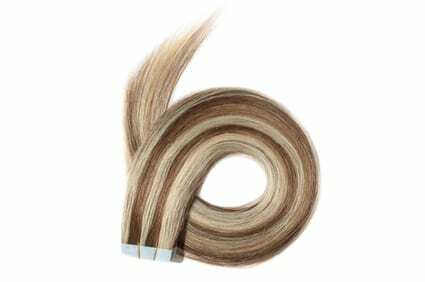 Human Hair Extensions are considered a hygienic product. We take matters of hygiene and public safety seriously. All items properly returned under this policy are eligible for a full refund and our representative will make sure the process is as easy as possible. Please understand that we cannot take back Hair Extension that has been styled, cut, colored, highlighted or altered in any way. The Hair Extensions may NOT be exchanged under any circumstance. Create a horizontal part across the back of your head about 2 to 3 inches from the nape of your neck. Clip the rest of your hair away. Measure the part and cut a weft slightly smaller than the measurement. Apply a thin line of glue along the rough side of the band at the top of the weft. Press the glue-side of the weft along the part, about 1/4 inch from the roots. Lightly press your fingers all along the weft. Hold the extension in place for about 30 seconds to allow the glue to dry. Unclip your hair and create another horizontal part across the back of your head about 1/2 inch above the first part. Repeat the applications until you reach just below the crown of your head. Extensions applied any higher will be visible. Make a horizontal part about 1/2 inch above your left ear. Cut a weft slightly smaller than the part and repeat the applications until you reach just below your temple. Repeat this process for the other side of your hair. 1. Make a part above the nape from ear to ear to attach the shortest hair extension. 2. Smooth the rest of your hair away from the part and secure with a hair clip. 3. Slide the comb of the clip onto the roots of the part, and push the clip closed to secure. Tease thin hair at the root of the part so the comb has more bulk to attach to. 4. Remove hair from the hair clip and part it again from ear to ear, 1 to 1 1/2 inch above the first extension. Apply a longer hair extension and continue adding to the back of the head. 5. Attach the shorter pieces to the sides of your head, above the ears, to frame your face, and blend hair. 6. Comb your hair to blend the extension hair with real hair. 1. 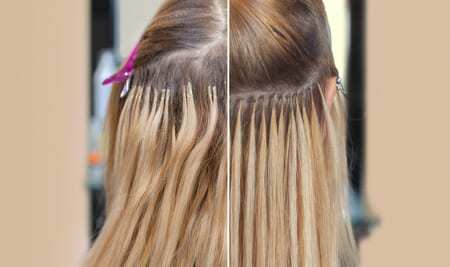 Tape in Extensions are simple to apply and a full head of hair can typically be done in about 30 minutes. Tape in Hair Extensions can be done at home although I do recommend you have a friend or stylist help you put them in so that you can get the best results possible. 3. Human Hair Tape in Extensions like all human hair extensions you can use your styling iron, curling iron and hair care products on them as you do your own natural hair. 1. Shampoo and condition the natural hair with a mild moisturizing shampoo and conditioner. It is very important to install hair extensions in clean, dry hair. Because micro rings can last for a while, you want all the dirt and debris to have been removed from the hair and scalp so the pores aren't clogged. Completely dry the hair before continuing. 2. Separate the hair into four workable sections: two in the front and two in the back. Hold the hair in place with clips. 4. Starting with one of the back sections, partition off 1 inch of the hair in a straight line. Separate the hair again into very small sections. Starting with one small section, slide the hair through the micro ring tube. 5. Take a portion of the extension hair and insert it into the tube as well. The hair should already be in pre-tipped portions. Work with one portion per section. 6. Use the closer tool to flatten the micro ring. This closes the tube and attaches the extension hair to the natural hair. 7. Repeat Steps 4 to 7 on the remaining sections of the hair until all of the extensions have been applied. To make the hair look completely natural and cover up the micro rings, leave a small section in the front undone. When you're finished, curl or style the hair as desired. Ready to add instant length and volume to your hair? With our halo style hair extensions, you can get the mane you want without fussing over volumizing and hair-growth tricks. Halo hair extensions are a fast and low-maintenance solution for styling your hair. And here at Hair Faux You, we manufacture our own extensions, bringing you more color and style combinations than many other retailers. From natural shades to neons and pastels, we have the colors you need to match your own hair. You can also choose from solid colors, highlights, and balayage or ombre. Why Choose Halo Style Hair Extensions? One of the best things about halo style hair extensions is how easy they are to put in. No glue, tape, or complicated braiding or weaving are needed. You simply pull the adjustable wire around your head and then tease your natural hair over the wire to hide it. 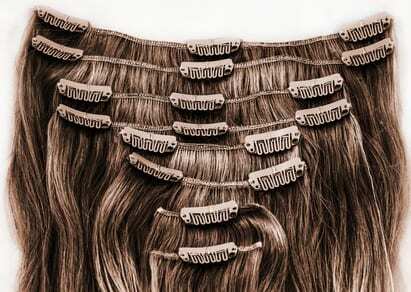 Each hair extension comes with two clips to make it even more secure. Why Do We Use Human Hair? 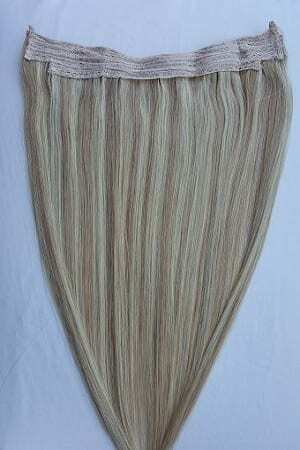 Our halo style hair extensions are made of 100% Remy human hair. One advantage of wearing hair extensions made from human hair rather than synthetic hair is that it feels softer and blends better with your natural hair. Another benefit is that you can dye and heat style them just like you do with your own hair. To learn more, click on one our products below for a detailed description. Just like your own hair, human hair will accumulate residue through normal wear. However, you do not need to wash the hair everyday to keep consistent results. The hair should be washed as infrequently as possible or when you notice that the hair appears dull or acquires an odor. While wet, gently comb the hair to remove tangles. Using a large toothed comb, move in a downward motion away from the clips and to the ends. Do not use a bristle brush on wet hair as it may pull out or break the hair. Hang to air dry, set in rollers, or use a blow-dryer on a low setting, as desired. If the hair is excessively dry, a "professional" conditioner may be necessary. Consult your stylist about this. Unlike your hair, this hair does not grow back if you cut it. So, remember to always take your new hair to a salon professional if you need it customized. This will give you the best results!